Illinois’ new governor is making it clear, he wants to see state government do a lot over the next four years. Benjamin Yount has more on the Governor’s Inaugural Address on Monday…. Gov. J.B. Pritzker’s to-do list is long, and could grow during his first year in office. 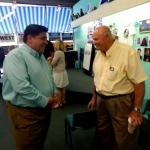 The new governor also took some jabs at Illinois’ old governor. Pritzker said his leadership won’t be arrogant. Pritzker takes office immediately, but will have some time before he has to work with Illinois lawmakers. Legislators aren’t due back at the Capitol until the end of the month.